1st VIC - Bow: Brian J Vear, 2: Derek E Norwood, 3: Charles J Lehman, 4: Paul M Guest, 5: John P Nettleton, 6: David Ramage, 7: Martin G Tomanovits, Str: Terry R Davies, Cox: David Palfreyman, Coach: Alan N Jacobsen, Emergs: Richard J Garrard & Michael F McKenna, Manager Ron March, Selectors: Dr Lloyd S Williams, Ron J March & coach. 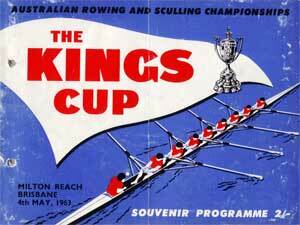 The eights race was a held start from punts which was unusal for those days. Heats and repechage was conducted on Friday with finals on Saturday. NSW defeated QLD, VIC defeated WA and TAS defeated SA in the heats. WA won the repechage convincingly from SA and QLD in that order. The final was one of the tightest finishes for many years. NSW and VIC led early and exchanged the lead at various stages down the course. The sculling championship was a first and final and resulted in a win to Graham Squires, his first win in eight attempts by a canvas to Jeff Sykes of Victoria. NSW led the lightweight four championship all the way but had to face challenges from Victoria and finished 1/2 length in front at the finish. The fours championship scored another NSW victory from the Queensland University crew with Victoria in third placing this time. The inaugural sculling championship saw a strong win to Helen Evans of Sydney by six lengths to Barbara Benson of Queensland.